Villas with enclosed pools are rare in Sicily but a stylish, family-friendly villa with a fenced-off pool near the beach is practically unheard of! It is, therefore. 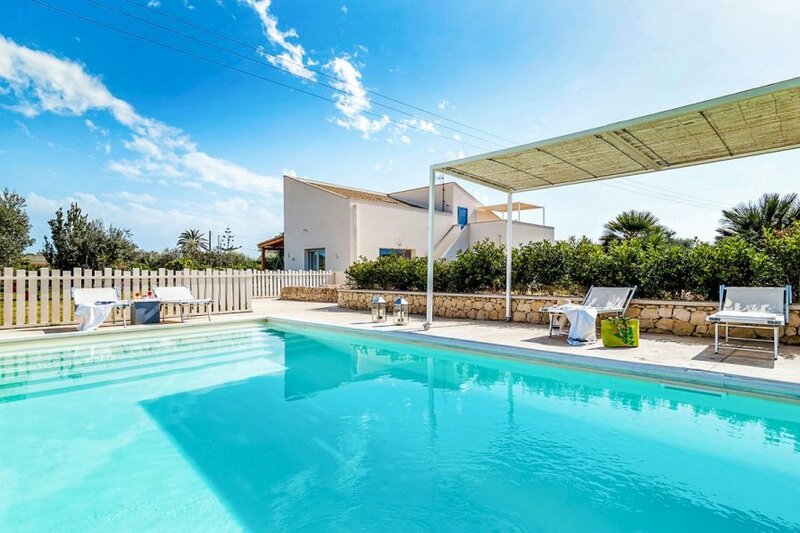 Villas with enclosed pools are rare in Sicily but a stylish, family-friendly villa with a fenced-off pool near the beach is practically unheard of! It is, therefore, no surprise that Villa Caponegro is a hit with family groups. Part of a new generation of recent restorations, this villa is designed and furnished to contemporary taste, with added touches of luxury, making it a unique place to stay. Just outside the coastal town of Avola in south-east Sicily, a country road leads through olive groves, citrus trees and farmhouses to the villa gates. Once inside the grounds, you will immediately feel like you have arrived in your own private oasis. The sizeable garden with neat lawns and mature trees feels private and ideal for children to run around, while the stunning white villa has a visible range of enticing design features for enjoying the warm Sicilian summer to the max. You can choose to spend your time outdoors in the inviting enclosed pool, lying back with a book in a hammock or relaxing on the comfortable seating area on the terrace. After a splash in the pool, head to the beautifully designed outdoor shower for a refreshing soak, while the designer outdoor kitchen with dining area is a delightful spot to gather for meals together. The living space inside is spread over two floors and feels pleasantly practical and welcoming. Here you can relax on a large sofa in the living room, cook up a storm in the modern kitchen with adjacent dining area or even go to the gym as you even have a private fitness room. The bedrooms are spacious with modern bathrooms, and the colourful twin room is set up with children in mind. Sandy beaches and nature reserves are nearby so a quick drive to the coast is a must, as is exploring the beautiful historical centres of nearby towns and villages. Villa Caponegro is a stunning pearl on the Sicilian coast. With 5 bedrooms and 4 bathrooms the villa can accommodate up to 10 guests. For those who love combining the beach with trips to nature reserves and historic towns, Villa Caponero makes a great base. Just under one hour south of Catania by car, the villa sits just outside the coastal town of Avola, a short distance from Gallina beach, the baroque town of Noto and the Cavagrande nature reserve. The nearest sandy beaches are family friendly, and all have parasols, sun loungers and casual beach bars. Although popular in summer, the beach stretches on for miles so you can always find parts which are less crowded. For those who love more natural, remote bathing, head to nearby Cavagrande del Cassibile nature reserve for its pools and waterfalls. The Vendicari nature reserve is just a bit further away and home to sand dunes, beaches and lagoons with a fantastic array of wildlife. Here you can also enjoy excellent walks along the coast. You may even spot migrating flamingos and nesting sea turtles on the shore. Within half an hour from the villa is the southernmost tip of the island at the lighthouse of Capo Passero and the charming fishing village of Marzamemi. The main square makes a gorgeous setting for a drink and is particularly buzzy in summer when it hosts an international summer film festival. Even if baroque architecture is not your thing, you cannot fail to be impressed by the handsome UNESCO protected baroque towns in the area, including Ragusa, Modica and Scicli. Noto is the nearest and one of the most impressive. Ideal for a stroll around the historic centre, you can admire magnificent honey-coloured stone churches or enjoy a gelato or pizza in one of the many restaurants.